Since launching Wealth Research Group at the beginning of 2016, I have dedicated a considerable amount of time understanding precious metals, and their relationship to other factors and assets. 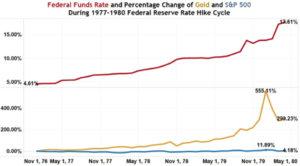 From 1971, when gold began trading freely, there have been times of massive inflation, credit crises, deflationary periods, high interest rates and low ones, peace times and excessive wars, currency devaluations and even negative interest rates. The economy went through so many situations and conditions the past 45 years that it’s easy to see why people have stopped doing research themselves blindly listen to mainstream media talking heads. The narrative that investors are being fed with right now is that gold doesn’t produce yield, so rising interest rates would absolutely be problematic for gold prices, but that’s conventional wisdom, and everything I have learned about financial markets tells me that following it will surely lead to terrible results. Bull markets end with euphoria! 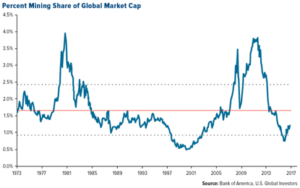 Today gold mining shares represent only a fraction of global assets – compare that to 2013, and you will appreciate the enormous upside potential. Interest rates are rising since the FED and the government see inflation starting to recede from historical lows, and with the proposed infrastructure plans, other construction metals have already began trading higher. 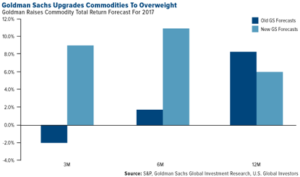 What’s paramount to understand is that rates rise, but so does inflation, so real rates remain low and even negative.In fact, Goldman Sachs turned bullish on commodities for the 1st time in years. Contrary to what the mainstream media is feeding the average “investor”, here’s what historically has happened during 1st and 2nd rate hikes. 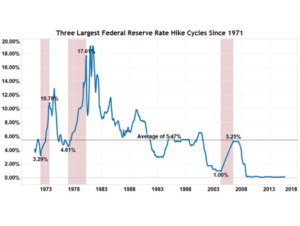 Until today there been 3 clear periods of rising rates – this will be the 4th. 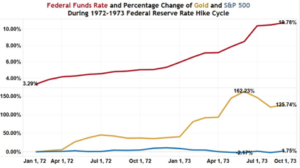 The first time occurred between February 1972 and September 1973, when the Fed Funds Rate increased from 3.29% to a high of 10.78%. During this cycle, the price of gold increased from $47 to a high of $123.25 – a full 162.23%. As you can see, tightening periods aren’t favorable for the S&P 500, as interest rates act as a weight on stock prices. But, it was the 2nd rate hike period that caught investors unprepared. Between January 1977 and April 1980, the Fed Funds Rate increased by a total of 1,300 basis points from 4.61% to a high of 17.61%. During this cycle, the price of gold increased from $129.75 to a high of $850, a gain of 555.11%. Gold gained 46-fold more than the S&P 500. Speaking with Canadian fund managers, I can say that gold is underweighted in their portfolios – Most Canadian pension funds are 2% weighted in gold stocks and the TSX index is eight percent, and this is going to continue until gold goes to new levels. There’s a whole surge of buying frenzy that hasn’t even scratched the surface. 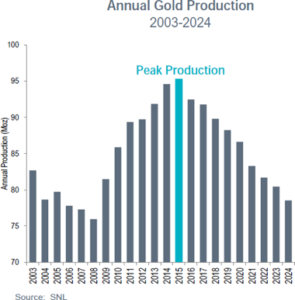 The thing that nobody seems to mention is that gold has hit peak production. There is currently 90M ounces mined annually, but only 40M are being discovered. That’s a 55% gap that is not coming back! The long-term picture is very bullish, and I am personally making big moves to position. Obama will be the 1st president to be at war for two full terms, and war spending is set to increase. Gold prices respond to increased war spending and federal budget deficits. Between 2001 and 2016, war-related appropriations totaled $1.7 trillion. Around 65% of this was spent during the height of operations in Iraq and Afghanistan, between 2006 and 2012. The explosion in deficit spending derived by war costs absolutely decimated the U.S. dollar from 2001 to 2012, but it was a clear reason to own gold and part of the reason it rose higher. In 2013, budget reductions in military spending caused Gold to stabilize. It’s now becoming increasingly clear that the top echelon of generals are requesting funds increase again, because equipment needs to be bought and soldiers are unprepared. Bloomberg just published an investigative article on this and learned that service men and women are literally dying because of the corners being cut to keep aged equipment in service. Gold is the ultimate form of money and the only type of money that governments cannot print. It is a core holding of the sound investor and contrary to what most expect, being a contrarian will again be the place to be. EXTREME Duress: Build On THIS! 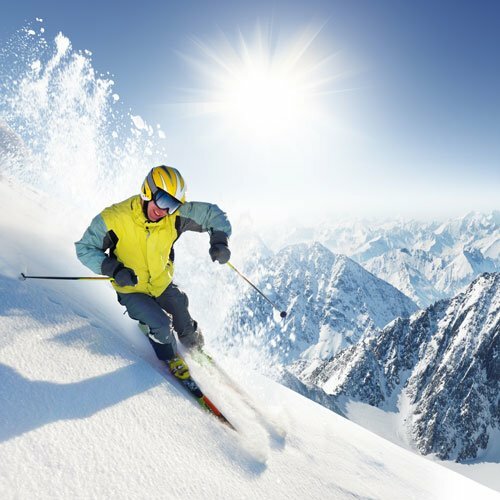 When Will Gold Stocks Take Off?